Mints need no introduction. You can grow several types for their distinctly different flavors or just stick to peppermint, the all time favorite. It also happens to have very high amounts of the primary active ingredient menthol. Peppermint, spearmint, apple mint or pineapple mint, they all grow well almost anywhere as long as they get sufficient water. But you’re likely to have a problem of plenty if you allow them to spread on the ground. Keep them contained in pots. Their refreshing smell can be enjoyed anytime if you keep the pots close at hand. Use the mature leaves as well as the tender stem tips to make the tea. Mint tea is cooling and refreshing; it helps improve digestion and reduces gas and associated heartburn. A cup of warm peppermint tea with a tablespoon of honey taken at night relieves a cough and ensures good sleep. This herbaceous perennial closely related to mints, and similar in appearance, gets its common name from its lemony scent. The medicinal properties of this herb are well known. Lemon balm tea has a calming effect on the nerves and is useful in relieving anxiety and restlessness. 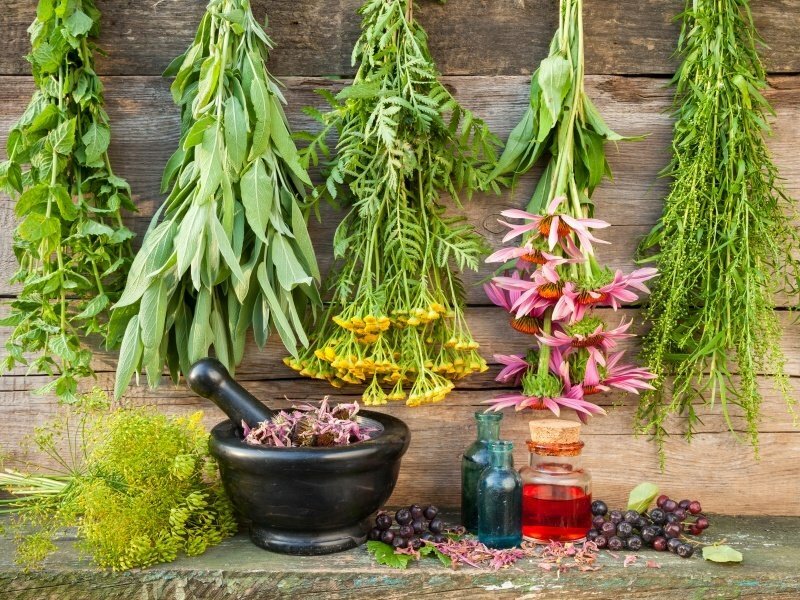 The herb is associated with a feeling of happiness and is regarded as an excellent natural remedy for irritability and hyperactivity in children, helping them settle down. When you have tension headaches or feel depressed, a cup of lemon balm tea can do wonders. The menthol content in the herb makes it useful in treating digestive problems like flatulence and indigestion. Its strong antispasmodic properties help relieve colic pain and menstrual cramps. It has strong antiviral and anti-inflammatory properties that help with cold sores and respiratory tract infections. Grow lemon balm in the garden or containers, but refrain from fertilizing this vigorous and rapidly spreading herb. Remember to prune it before it sets seed because it can take over the garden with self-seeding. Use fresh leaves for the tea or dry them in shade and use. This Mediterranean herb with fragrant lilac-blue flowers is a great addition to any herbal tea garden. Lavender fragrance is widely used in aromatherapy for its relaxing effect on the body and mind. Lavender tea also has a similar effect, and can be used to relieve anxiety and tension headaches. It can also be taken for gastrointestinal disturbances because it relaxes the smooth muscles of the stomach and intestinal walls, relieving the pain associated with indigestion. Grow English lavender from nursery starts for best results. Plant them in well-drained soil in full sun to simulate the Mediterranean climate, and they usually thrive with minimum attention. The flower buds are used to make the herbal tea. Collect the flower stalks when some of the buds start to open and then dry them in the shade. This North American native is a perennial herb, as decorative as it is medicinal. It is often grown in ornamental gardens for its brightly colored flower bunches in red, purple and pink, which attract bees, butterflies, and hummingbirds. But the herb can also make an excellent herbal tea. Bee balm tea is used to treat colds, headaches, and mild fever. It has a mild stimulating effect, but it is mainly used for its diuretic and digestive properties. The tea is a powerful antiseptic, often used as a throat gargle to cure a sore throat and for washing of wounds and skin eruptions. Grow bee balm in full sun or partial shade, giving it a relatively dry spot or a raised bed. Deadhead the blooms to promote bushy growth that will provide you with plenty of leaves for brewing the tea. All aerial parts of bee balm can be used for making tea, but young leaves are preferred when they are fresh. Leaves stems, and flower heads can be dried and stored for use round the year. Many herbs with daisy-like flowers go by the name chamomile, but the ones used most commonly in herbal preparations are German chamomile and Roman chamomile. Both have medicinal properties, but German chamomile tea is more popular as a calming drink, often used as a sleep aid. Chamomile tea can be used to treat mouth ulcers, gastric ulcers, hay fever and other respiratory tract inflammations, menstrual cramps, and fibromyalgia. It can calm a cranky child whether it is the case of colic, nervous anxiety or attention deficit hyperactivity syndrome. Whenever you are disturbed or unable to sleep, a cup of chamomile tea can is a great go-to. German chamomile is an annual, often found growing wild in dry areas. Raise it from seeds in spring and plant them in a partially shady spot. Once established, this plant thrives on neglect. Drought-like conditions produce the most flavorful herb. The white flowers with prominent yellow centers are used for making the tea. When they are used fresh, you need a handful of flowers to make the tea, but only a tablespoon of dried flowers are required otherwise. Thyme is a mint family member, but the volatile agent thymol is responsible for its distinctive smell. Thymol is a common ingredient in toothpaste and mouthwashes because it suppresses bacterial growth and bad breath. Thyme tea is excellent for stomach problems, especially indigestion, intestinal worms, and gas. Thymol has powerful antimicrobial property against a wide variety of pathogens, including antibiotic-resistant superbugs like MRSA. It can be used to treat laryngitis, bronchitis, and other respiratory tract infections. Thyme tea mixed with raw honey gives quick relief from coughs and colds, including whooping cough. Use it as a throat gargle to cure strep throat and tonsillitis. Grow thyme in the garden or containers, but it performs best in poor soil and dry conditions. Start new plants from cuttings or division of old clumps. Harvest thyme leaves along with the stems to make tea and dry the remaining. Start your herbal tea garden with the most commonly used herbs above, but continue to add more variety as you develop your taste for this health promoting drinks. 7. Sage – This herb works much the same way as thyme. Use sage tea to treat a sore throat, cough, rheumatism and heavy menstrual flow. It is a liver and kidney tonic. 8. Ginger- The fresh or dried rhizome of this tropical herb can be added to herbal teas or regular tea to enhance their health benefits. Besides increasing the absorption of nutrients from the digestive tract, it relieves nausea and vomiting, clears the respiratory tract, and reduces inflammation. 9. Perilla – The aromatic leaves of both red and green perilla can be used to make shiso tea. It can relieve nausea and vomiting, persistent cough and a stuffy nose, allergy symptoms, and premature aging. 10. Lemon grass – The gentle, lemony tea made from this tropical grass helps relieve stomach aches, vomiting, muscle and joint pain, and coughing. 11. Stevia – Use this herb in any of your herbal teas to sweeten them without the use of refined sugar. Use fresh leaves or dried and powdered leaves. 12. Purple coneflower (Echinacea) – This North American perennial has a long history of medicinal use. Use Echinacea tea as a preventive against seasonal colds and flu, as well as for treating upper respiratory tract infections. It can relieve rheumatoid arthritis, chronic fatigue syndrome, vaginal infections, and urinary tract infections. Herbal teas are easy to make since all you have to do is pour boiling water over the herbs and cover the vessel with the lid. Allow them to steep for 10-15 minutes when you use fresh herbs, and up to 20 minutes when dried parts are used. Filter out the clear tea into a cup and slowly sip it, savoring the unique flavor of the healing drink. When you make herbal teas with fresh ingredients, pick them just when you need them. Wash under a running tap before transferring them to a jug or bowl. The container used for brewing herbal teas should have a well-fitting lid. You don’t want the volatile agents in the herbs to escape; they are responsible for most of their healing properties. When you drink the tea warm, inhale the vapors to enjoy its distinctive aroma. 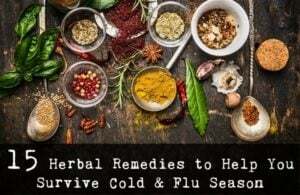 Some of the substances in the herbs are directly absorbed into the blood through the mucous membrane lining the nostrils and the airways, bringing instant healing. Store leftover tea in the refrigerator for a day or two, but it is always better to brew a fresh batch each day, especially when you have the herbs within reach.